LEARN WHAT ACTING CAN DO FOR YOU! Re-invent yourself! Improve your speech and shape the sound of your voice. Learn to relax, overcome shyness, banish bad nerves, negativity and achieve calm. Learn to address an audience, or conduct a successful one-on-one. 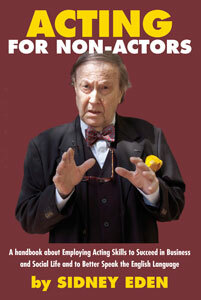 Over decades, countless students, in a range of trades and professions, have profited from the lessons taught in the author’s ACTING FOR NON-ACTORS classes in NYC, now summarized in this short, comprehensive, handbook. Part textbook, part romantic parable – It’s not about becoming an actor (though reading it won’t hurt dedicated thespians) it’s about learning from acting techniques IN ORDER TO BETTER PRESENT YOURSELF AND PROSPER IN TODAY’S WORLD - no matter your age or origin. AN EXTENSIVE APPENDIX IS PROVIDED FOR IMPROVED ARTICULATION AND SPEAKING OF THE ENGLISH LANGUAGE. IF YOUR BUSINESS CAREER OR SOCIAL LIFE NEEDS A SHOT OF ADRENALIN ACTING MAY CHANGE THE COURSE OF BOTH! This is the original ACTING FOR NON-ACTORS, as created and taught by Sidney Eden in NYC in 1982,and now contained in this 96 page book. Hundreds upon hundreds of professionals in all works of life - doctors, lawyers, assistant D.A. 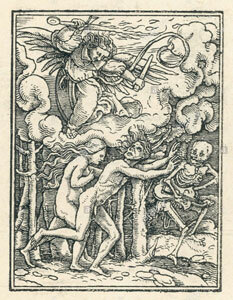 s, executives, publishers, detectives, executive secretaries, and policemen, among them - profited from Eden's course. TAKE ME TO THE BOOK WEBSITE! 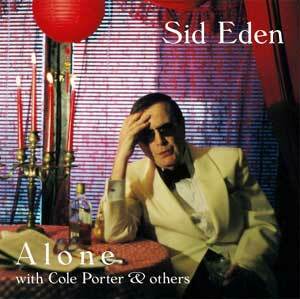 click on the Alone with Cole Porter & others CD cover for more details. click on the CD cover to see what the critics have to say! 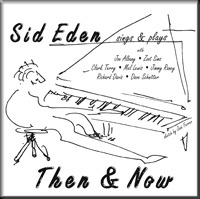 click here to view a list of all Sid Eden Music CD's.